New faces will be on the stand as the smash-hit revival of Agatha Christie’s Witness For The Prosecution receives a new cast from Tuesday 27 March, led by former EastEnders actor Ben Reid. Reid, best known for playing Ben Mitchell for four years on the popular BBC1 programme, will be joined by Lucy Phelps (Call The Midwife) as his wife Romaine. Richard Clothier (Fantastic Beasts And Where To Find Them) joins to play Sir Wilfrid Robarts, Julian Curry (The Alchemist) will play Mr Justice Wainwright, and Peter Moreton (The Winter’s Tale) will portray Mr Mayhew. Philip Franks (Art) will continue in the Witness For The Prosecution cast, playing the role of Mr Myers, along with returning cast members Richard Attlee, Jules Melvin and Hywel Simons. Also joining the company will be Charlotte Blackledge, Molly Jackson-Shaw, Parys Jordon, Tyler South, Antoinette Tagoe and Matt Weyland. 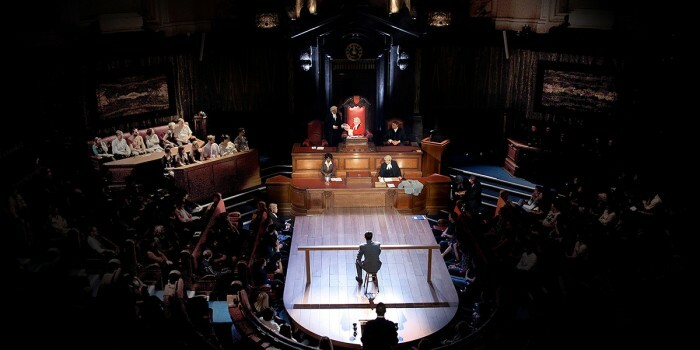 The classic courtroom play Witness For The Prosecution is currently playing out in the atmospheric London’s County Hall on the Southbank, in a spectacularly ornate Chamber setting. The show thus thrillingly places the audience in the thick of the action, with some seats even available in the jury box. A twisting and turning courtroom trial unfolds when Leonard Vole is accused of murdering a widow to inherit her wealth. The stakes are high – and the hangman’s noose looms. Will Leonard survive a shocking witness testimony, and convince the jury of his innocence? Witness For The Prosecution is currently booking at London County Hall until 16 September 2018.